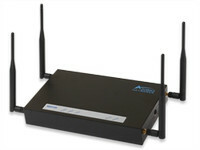 The Aruba MSR1200 indoor wireless mesh router delivers high-performance networking to indoor environments where wired connectivity is impractical or unavailable. Ensuring seamless mobility with Aruba outdoor wireless mesh networks, the MSR1200 is ideal for indoor deployments where backhaul cabling is difficult to deploy, such as in large retail centers, convention sites, warehouses or when a temporary network is needed. The MSR1200 consists of two independently configurable 802.11a/b/g/n radios for flexible indoor wireless mesh deployments using the 2.4-GHz and 5-GHz bands. 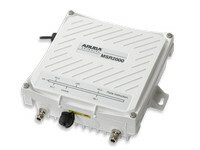 Each radio may be configured to operate as an access point (AP) and provide full mesh backhaul. This two-radio architecture separates client access and mesh backhaul data while optimizing radio resources for both types of traffic to ensure high throughput and low latency. The MSR1200 leverages Aruba’s Adaptive Wireless Routing™ (AWR™) technology, which automatically optimizes traffic routes between multiple wireless mesh routers. AWR creates a truly adaptive mesh infrastructure that adjusts dynamically to traffic levels and RF signal strength to ensure high availability and zero performance degradation across multiple hops. Aruba’s MobileMatrix™, another key Layer 3 technology inherent in the MSR1200, allows clients to move between wireless mesh routers in under 50 milliseconds, maintaining a seamless connection for latency-sensitive applications such as video and voice. The MSR1200 employs Active Video Transport™ (AVT™) traffic shaping and load balancing technology across long-range directional links to deliver HD-quality video from mobile and fixed surveillance cameras, monitors and recording systems. AVT delivers enhanced video at up to 30 frames per second across the distributed wireless mesh infrastructure using deep packet inspection, MAC protocol optimization, an in-network retransmission protocol, and adaptive video jitter removal. The MSR1200 reduces capital and operating costs by simplifying deployment and eliminating the need for cabling in indoor environments. Aruba wireless mesh routers eliminate the high cost of installing copper or fiber optic cabling, as well as monthly fees for leased line, digital subscriber line (DSL) and metro Ethernet services.